Apple agreed to pay $60m (£38m) earlier this month to Chinese firm Proview, which claimed it had registered the name in 2000. 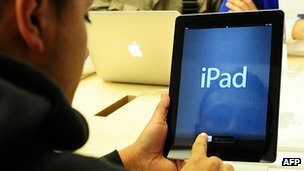 The dispute led to Apple's tablet computers being taken off the shelves in some parts of China. China is one of the biggest growth markets for Apple. The latest version of the iPad went on sale in the US and several other countries in March this year. Apple products have proven very popular in China, its second biggest market after the US. Last year, the release of the iPhone 4S resulted in public disorder after customers, who had been lining up for hours, threw eggs and scuffles broke out at a store in Beijing. Riot police were called in and the store was closed. For the new iPad, Apple said it would be available for purchase by reservation at the Apple retail stores. It will also be available at authorised resellers and the Apple online store.